With Big Bar Soft Spring Technology, our new G-Body front clip brings your car under control without compromising a plush and comfortable ride. This kit is the perfect compliement to our CenterDrive rear kit. With Big Bar Soft Spring Technology, our band new Nova front clip brings your car under control without compromising a plush and comfortable ride. This kit is the perfect compliement to our CenterDrive rear kit. Featuring custom valved shocks, adjustable ride height via coilover springs, and a NASCAR style swaybar package, our front clip not only looks serious, it works. Hotrods to Hell Inc. 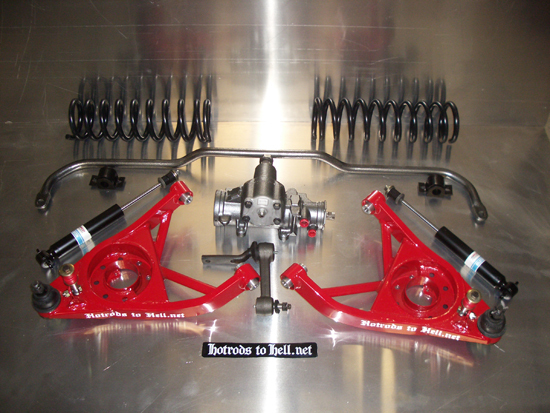 Stage 3 front suspension kit for first generation GM F body cars Camaro Fire Bird 67-69, also Nova 68 -72. 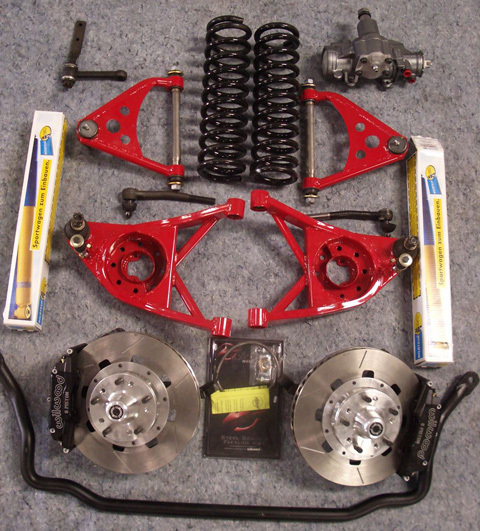 This kit gives you cutting edge handleing without changeing out your whole subframe. 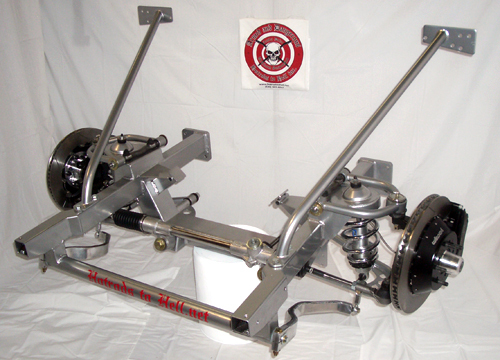 Our light weight tubular lower arms eliminate flex and reduce unsprung weight. We have moved the spring pocket outboard 1" for a wider spring track, allowing us to use a lighter spring and still reduce body roll. The arms feature a tall screw in balljoint, that bolts up to your stock spindle, eliminating understeer. We use a custom valved Bilstein shocks, a large Helwig swaybar, and our exclusive rated springs, giving you a Big Bar Soft Spring setup that rides like a cloud and corners like a slot car. We feature a custom built 12.7 to 1 steering box valved with a .35 torsion bar, for excellant feedback, and a new idler arm. Combine this with our Centrdrive truckarm rear suspension and your classic muscle car can out handle anything on the road. Our Stage 3 kit is priced at 1550.00 + shipping. We also offer a bolt on Wiwood 6 piston 13" Superlite hub and brake with this front kit. Ask for the stage 3 plus. This kit lowers the front for a functional aggressive stance, razor precision handling coupled with a smooth ride. Brakes: Taking full advantage of our exclusive Wilwood 6 piston Superlite caliper and 13"x1.25" slotted GT rotor, when compared to the 1LE rotor with stock B body caliper our setup saves 12 lbs of unsprung weight per wheel. This big breaks work great and look great peaking through the spokes a modern wheels. 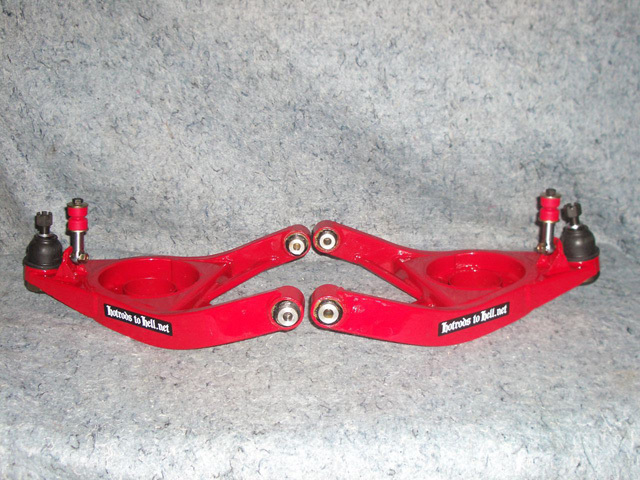 Suspension: Our control arms, tubular uppers with our rectangular tube lowers are the strongest and lightest available. 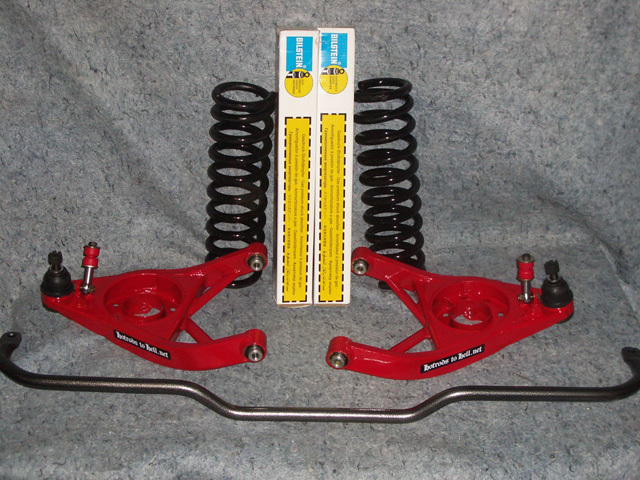 We use custom valved Bilstein shocks to match our spring and swaybar package. Our control arms combined with new spindles, fix the poor camber curve that cursed these cars when they left the factory. Steering: We replace your 40 year old steering gear with a dyno tuned 12.7 to 1 steering box, with a new idler arm and tie rod ends. This give quicker steering response, and takes all the slop out of your aged system. Combine this front kit with our famous Centerdrive rear kit and your GM A body will ride, handle, and stop like a modern high-end sport sedan. This is the finest, best handling and stopping front kit on the market. 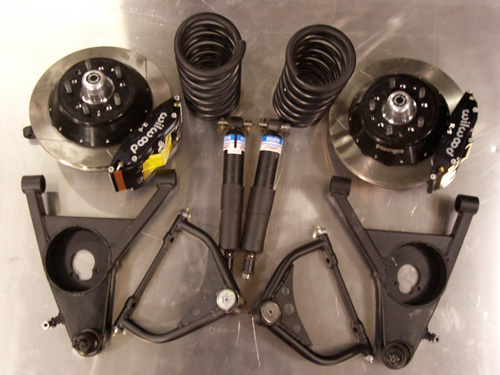 This kit represents the best of the best, but if you are on a tighter budget, we offer stage I and stage II kits that offer differetn brake and steering options. All the improvment of our lower arms with the added benefit of a tuned spring shock and swaybar package, couple this with our rear Centerdrive kit for the ultimate supercar handling. We feature Bilstein shocks custom valved for us by race car dynamics, as well as our custom length tuned spring. This package will lower your car for that perfect functional stance. Fits Camaro 67 to 69 also Nova 68 to 72. These arms are a direct bolt on improvement and are one of the easiest bang for the buck improvements that you can make on your car. We have designed them to be compatible with stock spindles. These arms utilize a tall screw in ball joint (MOOG) which corrects the camber curve, eliminating understeer. We have also moved the spring centerline 1" closer to ball joint centerline widening the spring track and improving roll rate. By the arms now, and you can always upgrade to the full spring, shock, and swaybar setup at a later date. Copyright 2008, Hotrods to Hell, inc.